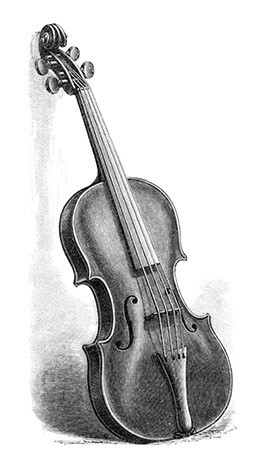 Fiddlers have played in Scotland for centuries, usually smaller tunes, rather than extended classical pieces, and some have differentiated them from violinists, by arguing that the former learned and played mainly by ear, hence were more a folk-style. Schools are still held each year in which this is still cultivated, however, edges of the categories are quite blurred. Dr. Neil Whitehead, of the Irvings in New Zealand, who very kindly provided some Scottish pipe tunes for the Clan Irving website, has also come up with The Session, an online collection of tunes (https://thesession.org/) most of which are suited to the fiddle, and there are at least 1000 examples, though most players are aware of many not yet in the collection. Scottish fiddle is hence an active vibrant musical genre. Related styles are found in Ireland and Cape Breton (Nova Scotia). Scottish style was supposed to comprise rich tone, use of vibrato, difficult keys, higher positions and fancy bow work. There was also distinct use of “Scottish Snap” which is a rapid note followed by one two-three times as long depending on time-signature. An example on this website is parts of Bishop Dunbar’s Curse. Even within Scotland there were regional emphases. Many would judge the Shetland and North Eastern styles to be the most prominent ones, with some others being Western/Isles, Border, and Orkney. The Shetland style: slow airs, waltzes and reels were particularly characteristic with sliding notes, and double stopping (two notes played at once). There is a distinctive and highly infectious swing to Shetland reels, ornamented by little triplets known as “shivers” and by the occasional droning of open strings. The North East style: almost exclusively used written notation, and may have had more crossover to classical violin playing. Strathspeys are particularly common and apparently originated in the area. Competitions are important and videos of yearly winners are often on YouTube. The Western style: included the Highlands but both the Pipes and Fiddle were frowned on by the Church as frivolous. During the century when Bagpipes were discouraged, the piping repertoire was taken up by the fiddlers, and has highly influenced the regional style. 2/4 Marches and jigs are predominant, and grace notes are more common than usual. As in the piping scale, the leading note is often flattened. Again this scale type is in Bishop Dunbar’s Curse. The Border style: was heavily influenced by Northumbrian music. This led to a predominance of hornpipes and slow airs. Unlike the open North East style, Border style tended to rich, dense harmony and double stopping. This would be what the Clan Chiefs and Clan Members of the Irvings of Bonshaw heard around them. A strathspey/reel set by Barbara McOwen a very well-known American fiddle player ‘The Irvings Welcome to Bonshaw’ and the ‘Kirtle Water’. Strathspey/reel; Mr A.F. Irving (Sheriff Depute (1875-1887 according to the British Almanac), for the Duke of Argyll) by the renowned Scott Skinner, and Bishop Dunbar’s Curse by Neil Whitehead, in which the bishop (1525) issued a dramatic and extended curse on Reiver clans, including the Irvings. Alas, reiving continued. Some of this curse and a roll call of Reiver names is part of an underground tourist pavement and commemorative boulder in Carlisle. Slow air and hornpipe in Border style; ‘Lochend’, the previous name of a village now called Beeswing near Dumfries. Allegedly the place of the Lady of the Lake in Arthurian legend. The ‘Dumfries Hornpipe’, named after the town. Both by Neil Whitehead.